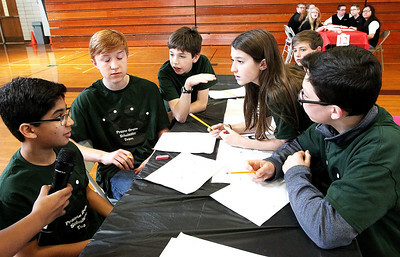 H. Rick Bamman - hbamman@shawmedia.com Prairie Grove Middle School students Fajiv Shah, (clockwise form left) Joe Schmidt, Michael Effinger, Nina Ricciardi, Joe Pokonoskt, and Vincent Carlini discuss an answer during the 30th annual middle school scholastic bowl at Marengo Middle School. H. Rick Bamman - hbamman@shawmedia.com Dr. Linda Dujmovich reads questions during the 30th annual middle school scholastic bowl at Marngo Middle School on Thursday. H. Rick Bamman - hbamman@shawmedia.com Marengo Middle School student Tom Lulinski's grandmothers Bonnie Wilke (left) and Ernie Clark and mother Beth Lulinski watch the competition during the 30th annual middle school scholastic bowl on Thursday. 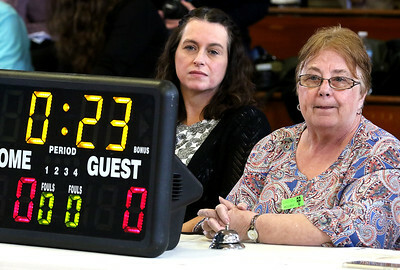 H. Rick Bamman - hbamman@shawmedia.com Time keepers Kenda Martin (left) and Barb Dochterman during the 30th annual middle school scholastic bowl at Marngo Middle School. 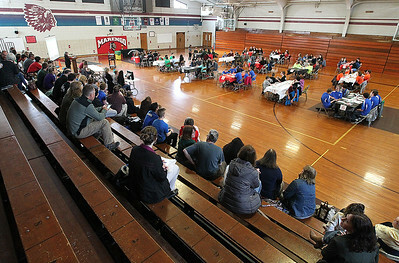 H. Rick Bamman - hbamman@shawmedia.com 30th annual middle school scholastic bowl Marngo Middle School. Diego Lopez of Riley Middle School in Marengo concentrates on an answer. Time keepers Kenda Martin (left) and Barb Dochterman, Prairie Grove MS students Fajiv Shah, Joe Schmidt, Michael Effinger, Joe Pokonoskt, Nina Ricciardi and Vincent Carlini discuss an answer. 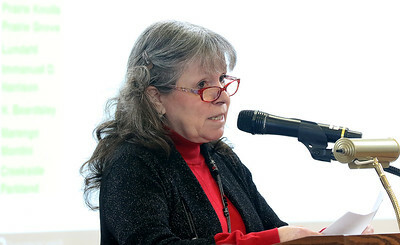 Dr. Linda Dujmovich reads questions. 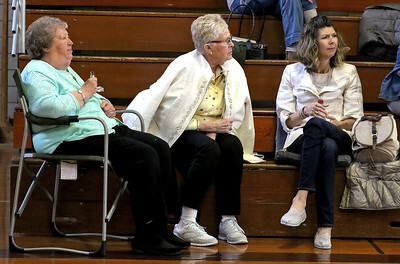 Tom Lulinski's grandmothers Bonnie Wilke (left) and Ernie Clark and mother Beth Lulinski watch the competition. Bernotas MS coach Beth Weber encourages her team. 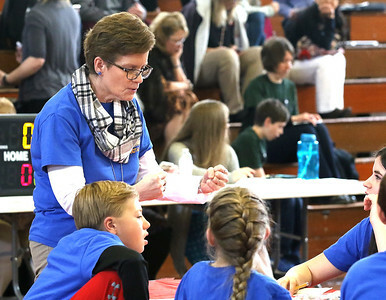 H. Rick Bamman - hbamman@shawmedia.com Bernotas Middle School coach Beth Weber encourages her team Thursday,May 4, 2017 at the 30th annual middle school scholastic bowl at Marngo Middle School. 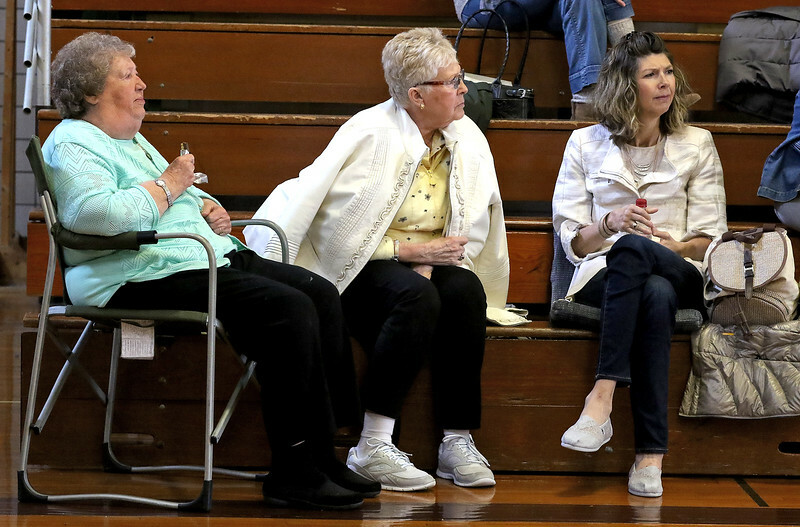 Marengo Middle School student Tom Lulinski's grandmothers Bonnie Wilke (left) and Ernie Clark and mother Beth Lulinski watch the competition during the 30th annual middle school scholastic bowl on Thursday.